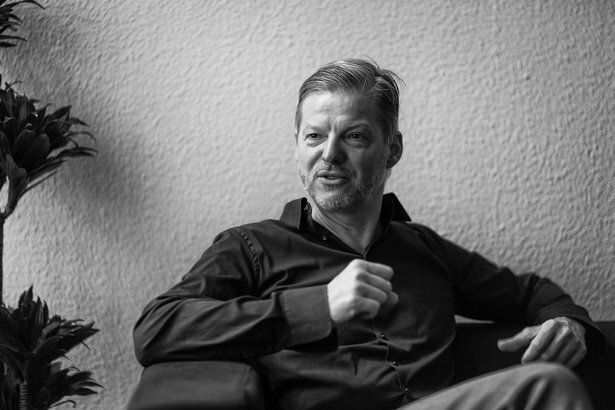 In the world of electronic music, Wolfgang Voigt hardly needs an introduction. Not only the co-founder of the Kompakt label, Wolfgang is also a renowned musician who has produced an epoch-defining body of work under the monikers of Mike Ink, Love Inc., Studio 1 or Gas – to name just a few of his better-known projects. Ever the interdisciplinary artist, Voigt has more recently focused his strong conceptual and aesthetic sensibilities on visual art. 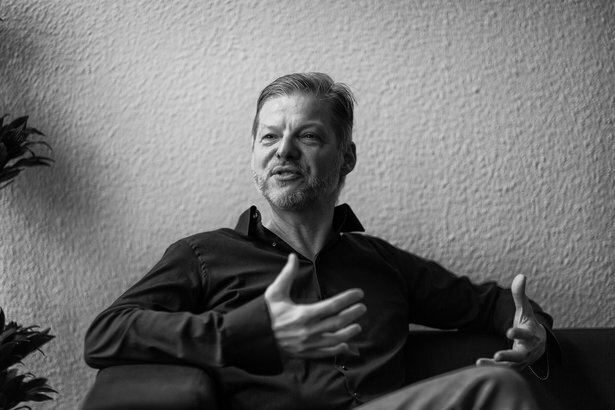 On the occasion of Kompakt’s 20th anniversary we spoke at length with Wolfgang about influences, the aesthetics of sampling, and making and breaking one’s own rules. You have described yourself as a die-hard Warhol-ist and Kompakt as “living pop-art modeled after Warhol’s Factory”. What have you learned from the first 20 years of Kompakt that might be useful for the next decades of “living pop-art”. Or, to put it another way: how does one age gracefully in this business? I suppose I’m a living example of that. There are two aspects of Warhol that interest me. One has to do with Kompakt, the company, the other has to do with my own artistic practices and principles. Warhol is one of the great artists of repetition, of the loop: we all know his Marilyn in her many variations. This strain of thinking in art and music has always excited me. I see a parallel in the principle of repetition, seriality. The other aspect of Warhol is the oft-quoted idea of ​​the Factory. I've always been inspired by this, and this is how I’ve gone about my business; living and working under one roof, with friends. This way I can pursue my business interests within the context of a family. The main difference between Warhol's Factory and ours is that Warhol's Factory was exclusively about Warhol’s art. In contrast, Kompakt is, above all, about other people’s music, and only peripherally about my own music. I hardly release any of my own music on Kompakt. I have my own labels, which are in turn distributed through Kompakt. This is a different interface. Kompakt is a label to which my main contribution - that is when I was more actively involved - consisted primarily of knowing the music of others and of helping to promote and package it as Warhol might have done – by giving it a corporate identity, a means of visual recognition. But I like to think, and I am always happy to be corrected, that we are a good example of how to age gracefully within the culture of techno, and I can even see a perspective for the next twenty years. On the one hand, it’s always evolving, changing with the times. On the other hand, we are firmly anchored within a tradition. Being on this two lane road, or, shall we say, oscillating between these two poles, our future is basically unlimited. Speaking of dualities, you once said that what you and Kompakt do is pop within the terms of techno. What is the essence of pop for you? And the essence of techno? I have sometimes, as a key musical message of the label Kompakt, put it this way: "We understand Kompakt as a pop label operating under the conditions of techno". Of course, we grew up with techno and the music has a straight-ahead bass drum and functions in a techno club. We say "pop" for two reasons. For one, most of our former and current A&R people, especially Michael Mayer and I, have a pop upbringing. In the 80s, we were both heavily influenced by various Anglo-American pop music. And it's not hard to discern that spirit in Kompakt’s output. We have a penchant for harmonies and for vocals. We also consciously say: "We differentiate ourselves from pure minimal techno variants, as they are practiced by other artists or in other cities." Everybody knows these stereotypes: the "Sound of This" and "Sound of That" and of course there’s something to them. But for us, pop is more of an attitude. It doesn’t have to sound like pop. I now think of myself as more of a pop artist than as minimal techno producer. Or maybe as a minimal artist. This is also a question of philosophical training and the background that one has. It doesn’t have to sound like pop to be pop, it’s a question of mentality. The new arises out of the old. In electronic music – in your music specifically – the past often appears in the form of samples. Here’s a hypothesis: one could say that producers who use sampling techniques can all be located somewhere on a continuum that stretches from healthy irreverence to worshipful veneration in regard to the material they’re sampling. Where do you see yourself within this continuum? Over the whole range, it depends. Generally, you could say that sampling is my instrument. It’s my guitar. When I first began to immerse myself in sampling, I thought this instrument was made for me. The “referencing of external sound sources”, as I prefer to call it these days, is something that just fits perfectly to my thinking as an artist. This bring us back to Warhol – taking an existing picture of Marilyn and painting over her. If I take a sample – whatever it is from classical to jazz, from A to Z, it can be anything – I have an external sound source, which I embellish and condense. Nowadays, my goal is to liberate the sample from what it was originally intended for, and to use it only as material to make something new. My thinking here, although still based in sampling, has changed. In the 90s, when sampling was the new thing, I, like so many other people, cited external music like T.Rex or Wagner or Schoenberg in my ambient “Gas” project. But this leads to a misunderstanding: if you make it too obvious, people overestimate the significance of the source. To me it's not about what’s been sampled, but what comes out on the other side. To some extent, you sample out of reverence: you find something great, you want to connect to it and preserve it, add something – or maybe take something little away that you do not like. Today, I have aesthetic preferences: I like a certain music, I throw it in my sampler, I modulate it, transform it, deform it, and so on. But I only use particular material as a starting point because I want its specific sonic world to appear in my music. I want there to be a connection but, ideally, I don’t want you to realize what it is. The end result can even be quite blurred. I tend more and more toward abstraction in the music – so that you no longer think "What could that be?". Because it could have been anything. Nevertheless, it is important that it was there in the background in the beginning – behind what I put in the foreground. This is a spiritual thing. I throw these spices into this obscure musical soup, but in the end you will not know where it all comes from. And actually you shouldn’t know. The music should speak for itself. An essence is preserved. And it’s precisely in this inexplicable realm, in the momentum that samples bring with them, where the magic lies for me, the magic of music. I have been an avid Ableton Live user for some years now. Sampling plays a big role for me – messing around with audio files. It is well known that the possibilities to bend audio files quickly in all directions, work fantastically in Ableton – and I'm certainly not the first one to say so. I'd be lying if I called myself a "technical layman", but I am relatively uninterested in attaining "advanced" knowledge of technology. Ableton has simplified this enormously by accommodating my thinking of structural simplification. Sampler is great because you can manipulate the parameters of the sample exactly like I was doing in the 90s. At that time, I was working with hardware samplers – the Roland 750 was my weapon. At some point it all went digital, but all the samplers I had between the Roland and the Ableton Sampler couldn’t do some things – alternate, forward, backward, set loop points that don’t click. I play live with it. I use the thing like a guitar and a whammy bar. I play it like a virtuoso. There are these two things: that while the groove keeps going, (if it is supposed to groove), I can play around with the audio files. That I can slide, stretch, transform audio in the Sampler – this is sensational. You pitch a song up while taking the tempo down. To be able to penetrate into music in this way is an ingenious form of disrespect, and I think it greatly fosters creativity. One could say that the power of your music arises from a tension between freedom on the one hand and rigor on the other. One can hear this in your tendency to combine strict rhythmic frameworks with free or unusual tonal elements. The persistency with which you set up conceptual frameworks and follow through on them leads to unconventional results. Is maintaining this tension a matter of self-discipline? When you are producing, do you have a goal in mind from the beginning? Or do you need to periodically correct your course? Good question. There are several parts to the answer. Firstly, yes it’s true, there is on the one hand something that could be called extreme rigor – a stringency, a desire to groove and to ‘minimize to the max’ that I pursue very consistently and frequently. I say "Techno is bass drum – everything else is negotiable". That’s the null-point I always come back to. I just recently did a record that is one hour of a bass drum through an echo. I need that to synchronize myself with my own philosophies, so to speak. I would never just go into the studio and jam. This is not me. I improvise like mad with Ableton, because it works wonderfully and I can go a little virtuoso with it. I just made a piano record using the Arpeggiator - "Zukunft ohne Menschen". I had to think long and hard if I should allow myself the impudence, but then I just went for it. I only used the Ableton Arpeggiator MIDI effect, with nothing else – ok, there are two pieces with a bass drum, but that too is played solo, as if it were a piano. This is a sequencer that triggers patterns within certain specifications and a rhythmic framework. But I break this by playing by hand, improvising and playing like Chopin. OK, that may be a bit exaggerated, but the results are quite unusual. Specifically to your question: I go to the studio with a concept and I have clear rules. There are some primary things that I always come back to: one is the principle of "loop pattern" and "minimalism". I call this “the art of leaving things out”. Hypnotic minimal music with a beat – “Sog”, “Freiland” and projects like that. What I am working on more these days is “Rückverzauberung” – the successor to the “Gas” project: this is abstract ambient music. Modulating, deforming and penetrating into sonic worlds between atonality and euphony in which I try to create abstract spaces in ambient soundscapes. I practically crawl into the audio file to get it to deform in all directions into the abstract. This is an example of a concept that you can really hear. But what happen for me is this, and I say this quite openly: very often I find what I'm looking for not exactly where I would like it. But I usually find what I need close by. I find that with these things, chance plays a very positive role ... if you allow it to become a stylistic element of the music. I have strict rules when making art and music, but in the moment of creation I break them again and again. I am a man of transgression and contradiction. I don’t even accept my own rules – much less those of others. I always have to surprise myself. That is to say, the track is good when something happens that is somehow related to my choice of aesthetic means, but is not exactly what I wanted. Because "wanting", in the sense of arranging music, is something I keep trying to overcome. From my point of view, this is narrow-minded thinking. To say: “Here’s a bass drum, then comes the hi-hat,” I've done that millions of times. It doesn’t necessarily have to be that way. For myself, time and again, I have to justify why I should be using this hi-hat again on the off beats, for example. I have to create a scenario that provides a maximum degree of freedom that I have to legitimize for every new piece by combining and creating coincidence. So, to answer the question, it’s a mixture. I’m always on the move, always on the run from my own definitions.